Amish widow Emma Yoder’s first quilt class brings the most unlikely people together. There’s Star, a young woman yearning for stability; Pan and Stuart Johnston, a struggling couple at odds in their marriage; Paul Ramirez, a young widower hoping to find solace in finishing a quilt; Jan Sweet, a rough and tough biker doing some creative community service; and Ruby Lee Williams, a preacher’s wife looking for relaxation when parish problems mount. But as these beginning quilters learn to transform scraps of material into beauty; their fragmented lives begin to take new shape with the helping hands of each other and the healing hand of God. Coming in April, 2012 from bestselling author, Wanda E. Brunstetter. The Half-Stitched Amish Quilting Club has been made into a musical play. For 2013, it will open in April at the Blue Gate Theater in Shipshewana, Indiana; in August it opens in Sugarcreek, OH, and in Sept. at Bird-in-Hand, PA. You may purchase tickets to see the play in any of these places by clicking here. 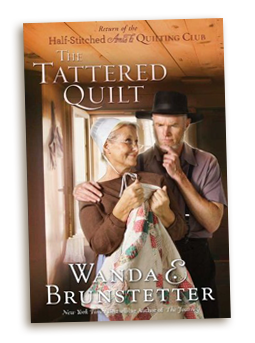 Join Emma Yoder Miller, the Amish widow-turned-newlywed, as she leads another quilting class with a new group of unlikely students, all with tattered pieces of their lives that need mending. Members of the patchwork group find friendship, faith, healing, and restoration while gathered around their quilts, under the Father’s guiding hands—for only He can take what’s ragged and shabby from the lives of His children and turn it into beauty for His glory. 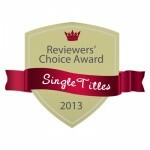 View the list of other winners of this award. Join the club of unlikely quilters who show up for Emma Yoder’s Amish quilting classes. Both Amish and English, women and men are inexplicably drawn to Emma’s home where they find what they never realized they were looking for. Is this what God had in mind to heal hurting hearts and create beauty from tattered fragments? Included are The Half-Stitched Amish Quilting Club, which inspired a musical, along with The Tattered Quilt and The Healing Quilt. 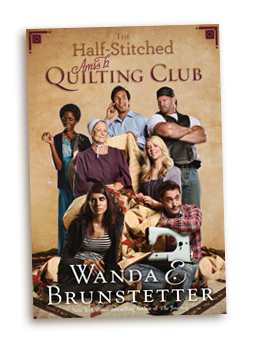 I enjoyed writing The Half-Stitched Amish Quilting Club, and it was fun to get into the heads of so many different characters. Having been a pastor’s wife myself, I could easily identify with Ruby Lee Williams. I know several dear Amish women who are a lot like Emma Yoder—always willing to help others, and full of wisdom and understanding. It was especially fun to develop the character for Jan Sweet, who reminds me of a relative I haven’t seen in a good many years. 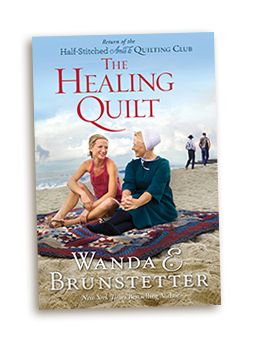 After the book came out, I had requests from many readers, asking me to write a sequel to The Half-Stitched Amish Quilting Club, so I wrote Book 2, The Tattered Quilt, which will be out in August. I will soon begin writing a third book in the Quilting Club series that will be published in 2014. "I have always loved Wanda's Amish fiction but this one was the most thought provoking that she has written for a long while, in my opinion. 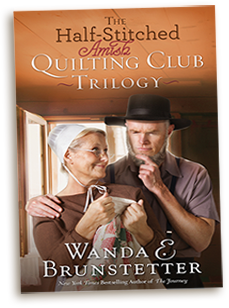 Wanda has used her knowledge of the Amish to its greatest advantage, while bringing in Englishers to enhance her storyline. Wanda has a complete surprise at the conclusion of her book, which totally shocked me. Her talent is outstanding in keeping you engrossed in the many changes in her plot and her character development. "A feel-good novel with memorable characters that come together in the most unlikely place and discover things about themselves they would never have known if not for the others. Brunstetter has outdone herself with this novel. Reading it is pure fun. Even though the characters have problems, they learn to overcome them and become the people God wants them to be." "This is one of Wanda’s best books yet! She does a great job creating characters who are dealing with problems that many people can identify with. One of my favorite characters was Star. She is a rebel without a cause, who only needs some encouragement to find her way. I think we all can relate to pushing the boundaries to see where we fit into this world. I enjoyed every page right down to the surprise ending! This is yet another fantastic book by Wanda Brunstetter. Happy Reading!"